The Pixel and Pixel XL are seriously expensive phones, aiming directly at the iPhone and Galaxy devices at the top of the market. 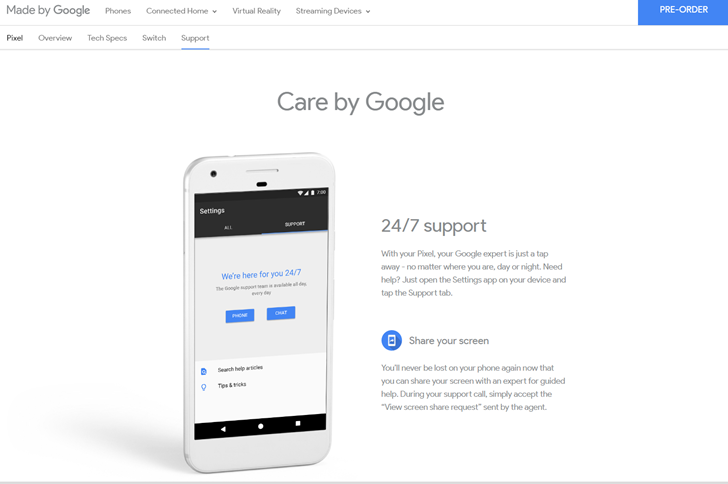 To help set them apart, Google announced that it would offer live support for owners 24 hours a day, 7 days a week. It comes in call or chat form, and users can even share their screen with support agents in real time. Amazon has tried something similar, and just like the Fire tablets, this is pretty clearly intended to help out non-technical users. The feature was leaked back in the summer. This sort of consumer-focused inclusion is another major departure from the Nexus line, which still retained a developer focus even when Google tried (and failed) to give them more mass market appeal. See also the iPhone transfer cable that will be included with the Pixel and Pixel XL retail packaging - Google's intentions really couldn't be any clearer. It's also worth noting that "Switch" and "Support" tabs are front and center on the Pixel area of the Made By Google website, given equal prominence with Tech Specs. We'll have to wait for the launch of the new phones to see how well the live support and screen sharing feature works. Keep in mind that this feature really isn't meant for the average Android Police reader... but it might be a good thing to keep in mind if you plan on steering your less tech-savvy friends and family towards a Pixel purchase. It might cut down on your holiday tech support duties.